For "Dome Dimensions", "Azimuth Control", leave the standard values. In "Shutter Control" section, choose a time longer than the time needed to open or close the roof and select "Operate anywhere". In "Interface Capabilities" unselect all options but Open/Close Shutter. For the "ScopePower" option you have to open the "Switch" tab of the LesveDomeNet User Interface See "Human interface" section of the LesveDomeNet home page. The options in "Non-Standard Behavior" are not used (uncheck them). Choose a time of 100 msec for the "Timer interval". Choose "Gray coder" option or another, it will not be used. Do not forget to select the K8055 address. A complete specific schematic(corrected on Jan 13th 2015) ED-ROR-V04.pdf has been designed for the ROR. As for the dome shutter, the LesveDome driver will assume that the roof move is finished in a fixed time (this time is defined in the Setup window). When the roof move is completed for opening or closing, magnetic switches (or others) deactivates a relay (K5) and the motor is stopped. This action is not performed by software, indeed it's always possible that the PC or Operating System fails during a roof move. Motor is stopped by hardware for safety reasons. The relay K7 activates the motor and relay K6 selects the move direction (opening / closing). A manual momentary switch (double through) SW2 is provided for manual operation of the roof. The relay K1 and K2 are used as a latch relay to switch the telescope power supply. A latch relay configuration is used to avoid telescope power supply interruption if you need to restart the PC. A rain sensor can be added to close automatically the roof if rain is detected. Any rain sensor providing a contact closure in case of rain can be used. 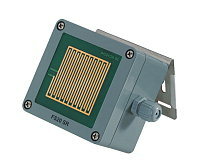 The Conrad company provides the FS20R rain sensor. They have representatives in Belgium, Germany, France, UK .... But I don't know if it's available in USA. This rain sensor provides a lot of other functions which are not used here. Be careful with the choice of a rain sensor, some of them provided by Conrad don't work. In the past, I bought a cheaper model (Part no. : 190351 - 89), without radio link but it didn't detect rain!! The "Death Man Switch" option will close automatically the roof in case of those problems. The Dead Man Switch has been designed having in mind the system used in railway trains. At regular intervals, a buzzer indicates to the driver that he has to push and release the Dead Man Switch/Pedal. If he doesn't do it a security procedure is started. 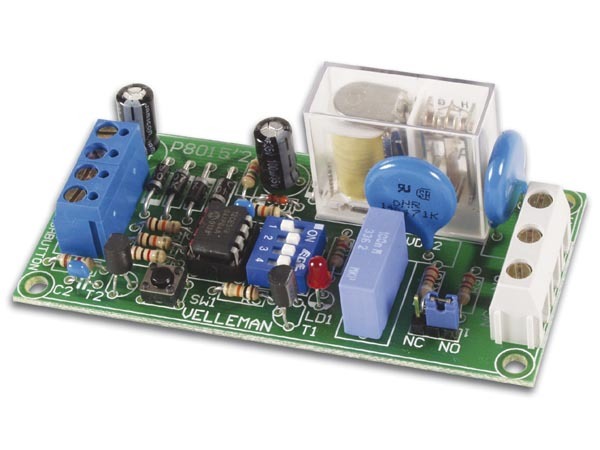 The "Dead Man switch" function is based on the Velleman K8015 and the relay K8. LesveDome driver is activating regularly the K8055 Digital Output #8 (every 50 Timer intervals). If the K8015 is not reactivated (like a staircase switch) with Digital Output #8 and relay K8, the internal relay of K8015 is no more activated. Then the relay K7 is activated for roof closure. The "Dead Man switch" function is disabled when the manual switch SW5 is open. Obviously the roof control circuit has to be powered from a battery or a UPS to cope with a main electric supply failure.